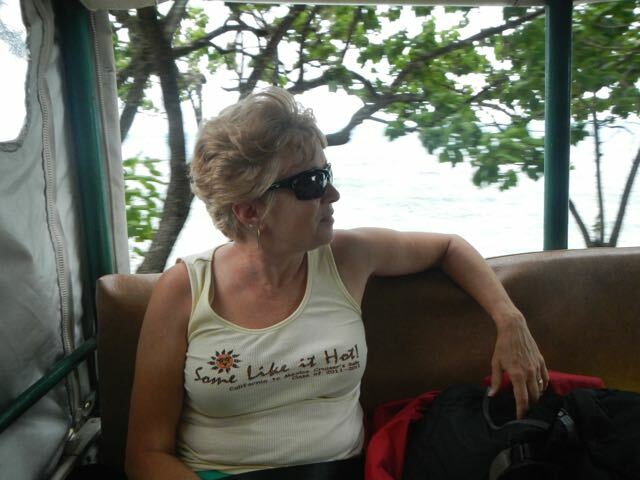 Conni had wanted to participate in one of these tours since she read about them weeks ago. 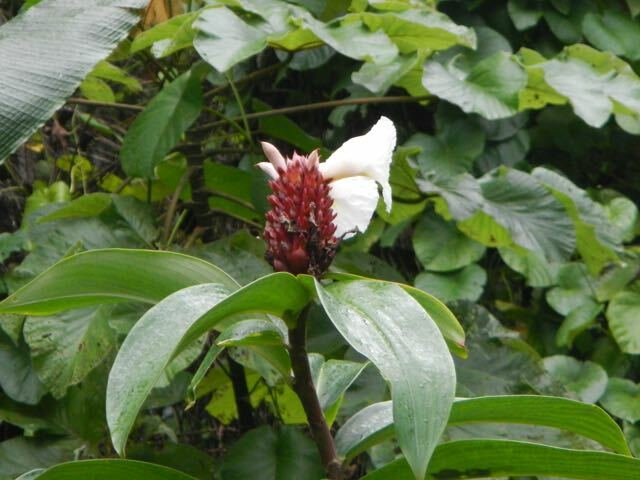 The Plantier family has been offering these tours since their own vanilla plantation failed due to disease and they decided to focus on tours rather than agriculture: a wise decision. 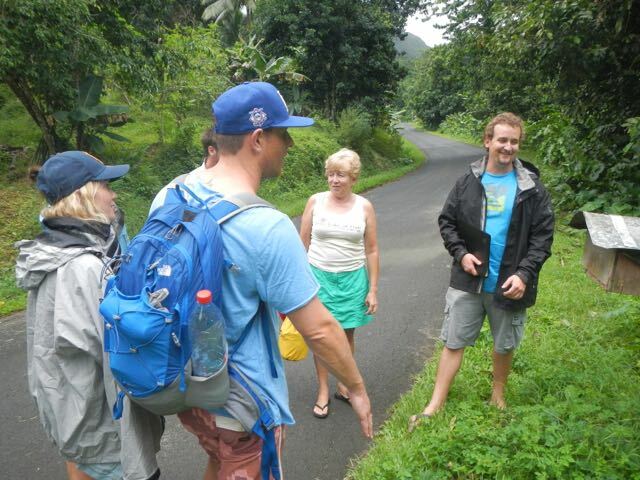 After we had visited the vanilla plantation, we were carried around the island in the family Land Rover. 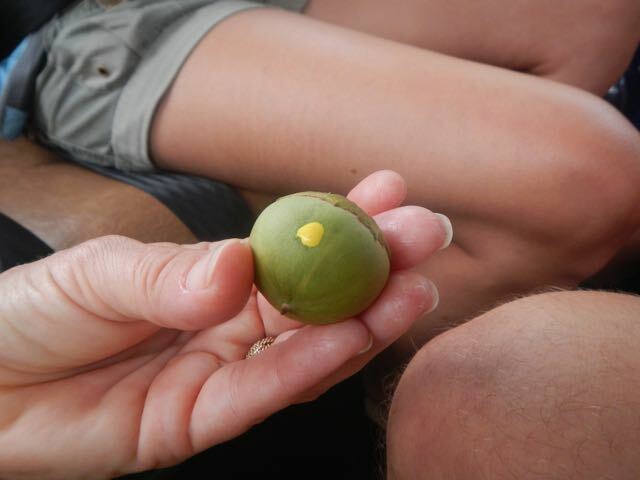 At the tour's end, we were given a wonderful fruit meal of items from their own garden. 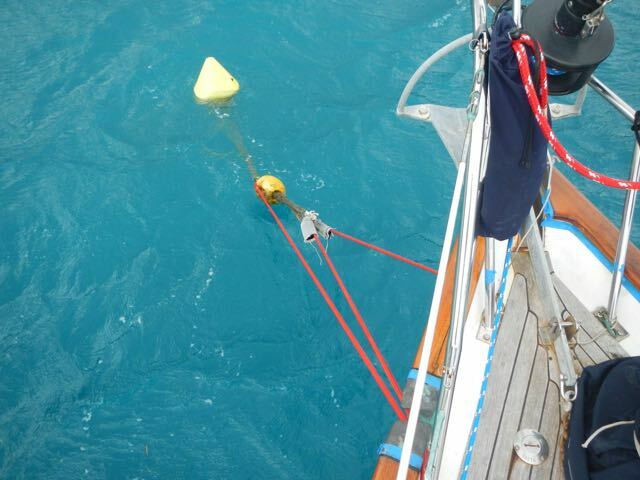 In anticipation of a very windy few days on our mooring ball, we doubled up our mooring lines and added an anti-chafe guard made of a foot of used fire hose (the grey material). Fire departments sell their used fire hose and it's in high demand for exactly this purpose. I'm sitting in the back of a Land Rover pick-up, modified to carry passengers. This kind of vehicle, usually just called "Le Truck", is used throughout the world as a taxi or for sight-seeing. We've used them from the Caribbean to Fiji. We're starting our afternoon tour with Noah Plantier of Vanilla Tours on Taha'a Island. 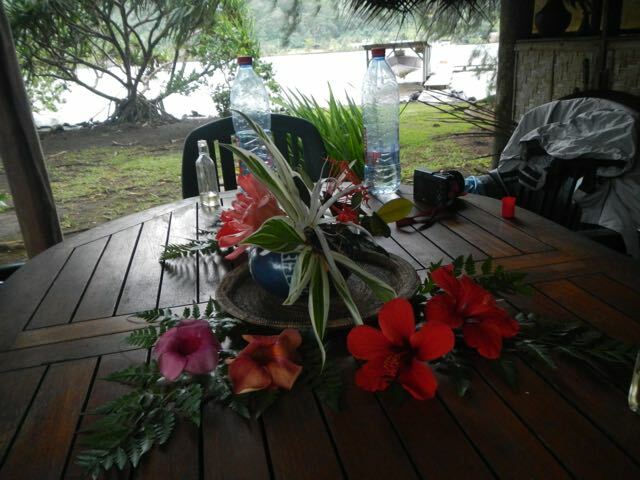 The open-air living room of the Plantier family on Taha'a. 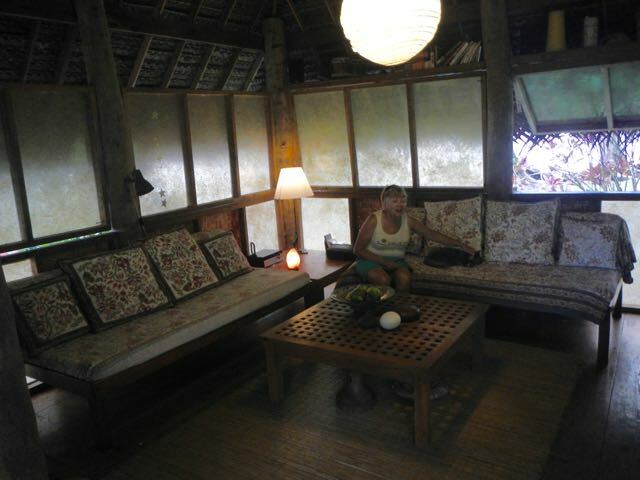 This is one part of a typical Tahitian-style residence, with separate small bungalows for cooking, sleeping and visiting. 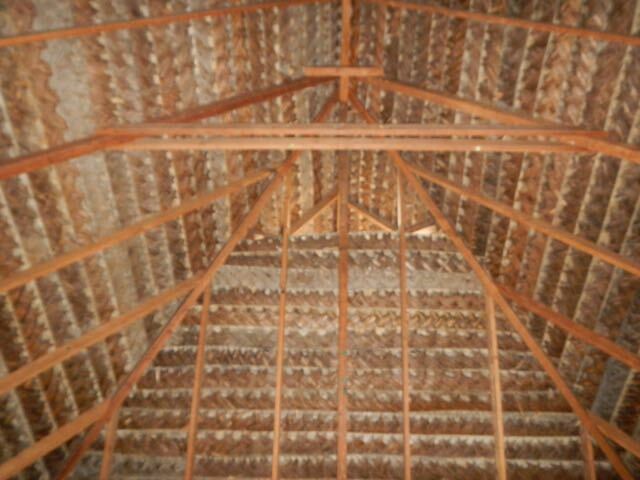 The roof of the Plantier family's living room: Exposed beams and hand-woven coconut-frond "thatching." It's similar to what we see in palapas in Mexico, but a bit more ornate. Our tour host, Noah Plantier, said the roof needs to be replaced roughly every five years or so. A close-up of a small section of the coconut frond matting that makes up the roof. Layers are put on similar to shingles. The central vane of the frond is at left and the individual leaves are woven directly on that. Fresh hibiscus flowers decorate the outdoor dining table at the Plantier family's home. The small glass bottles contain their own "bug dope" of coconut oil and citronella. 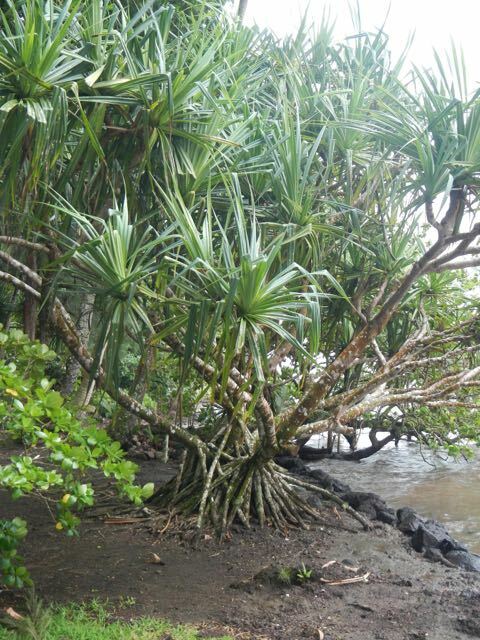 A pandanus tree. 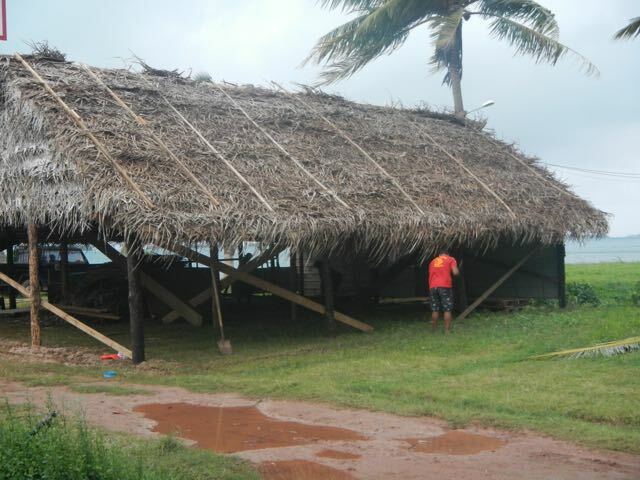 The matting for a roof can be made out of pandanus leaf instead of coconut, using a slightly different technique. 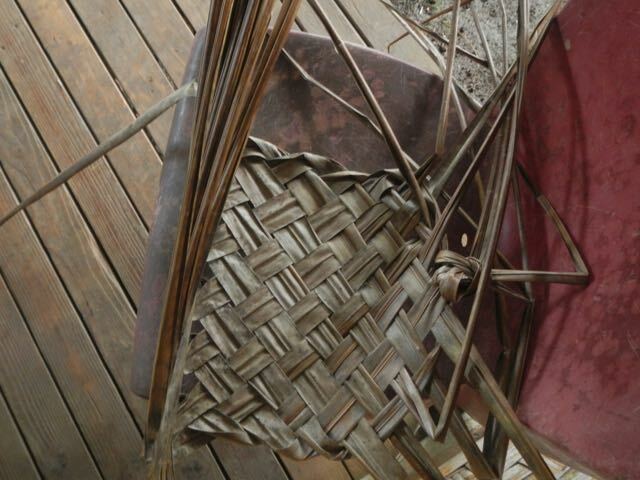 Basketry and other items woven of pandanus are found throughout Polynesia. It's obviously a salt-tolerant plant because that's ocean water right beside it! A banyan tree? 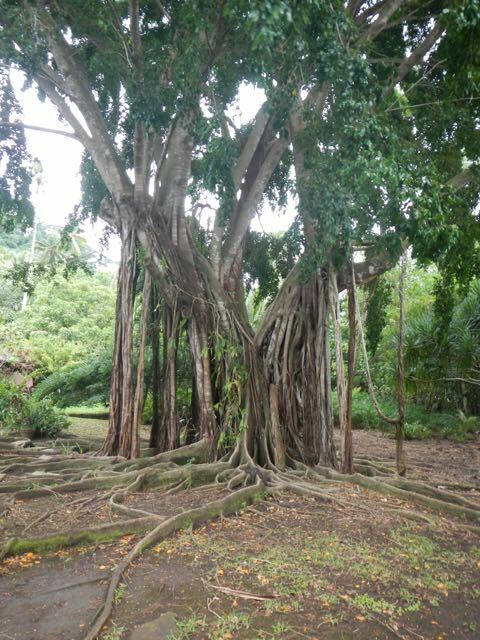 Nope, but a relative: a Tahitian fig tree. A bit larger than the ones we all have in our home or office! 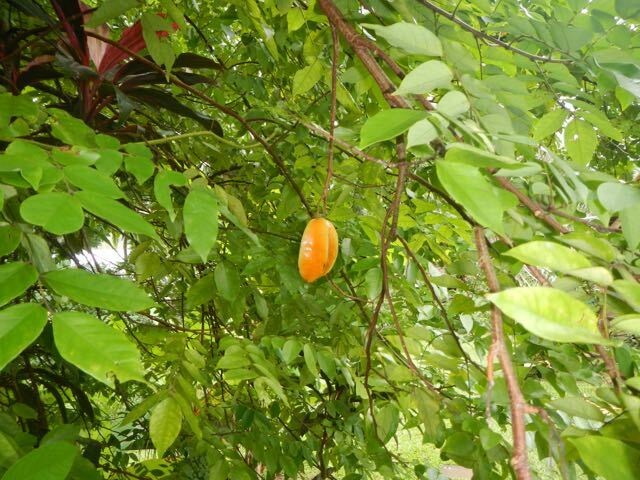 An orange variety of starfruit in the Plantier family's garden. Alain Plantier and his wife sailed to French Polynesia from France more than thirty years ago and after a detour to New Zealand, decided they liked Taha'a so much they returned, bought land and stayed. The beautiful house and garden are their handiwork, and their son Noah was our tour host. He's born and raised on Taha'a, although he returned to France, Paris, to earn a degree in aeronautical engineering. 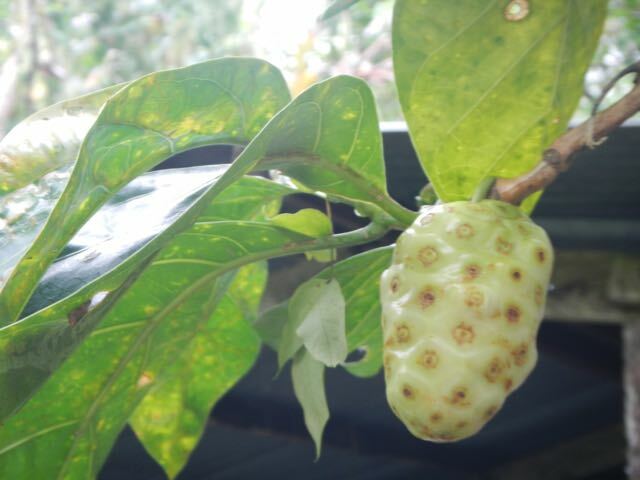 A ripe noni fruit. Noni doesn't taste all that good but is very high in vitamins and anti-oxidants, so quite a bit of it is turned into juice and exported to the USA and elsewhere to add to healthy drinks. 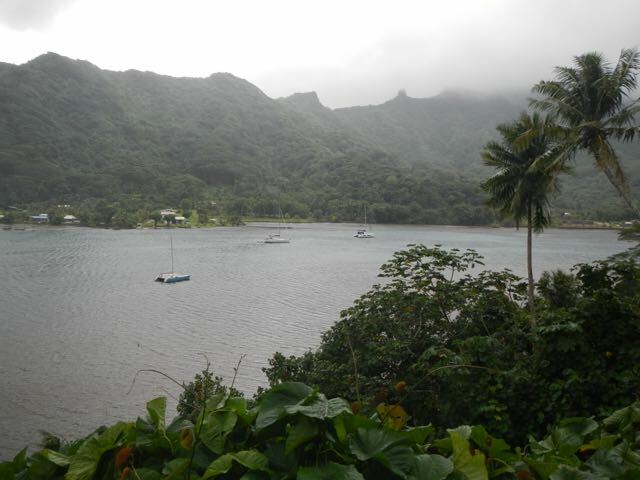 An overview of Hurepiti Bay on Taha'a, where the Plantier family lives. We're moored one bay further north, which had a bit more shelter from the high winds we've been getting and better yet, had available stout mooring buoys. Another type of ginger. We've seen several varieties just growing wild by the side of the road. Conni, Noah and a couple other members of our group as we're about to walk into a vanilla orchard owned by a family friend. 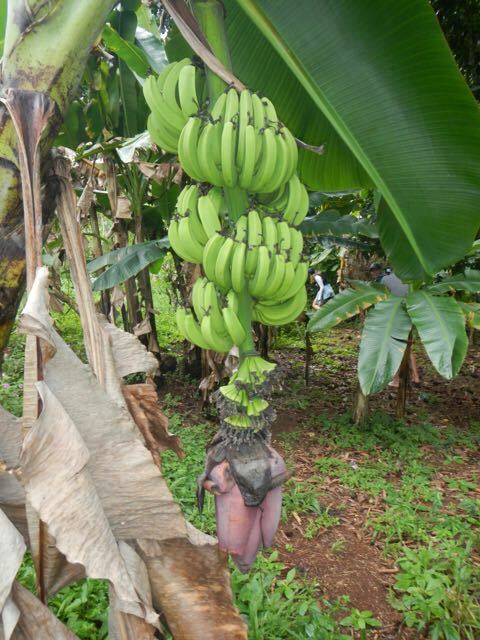 But first we have to walk by a banana tree with a large bunch of unfortunately not-yet-ripe bananas. 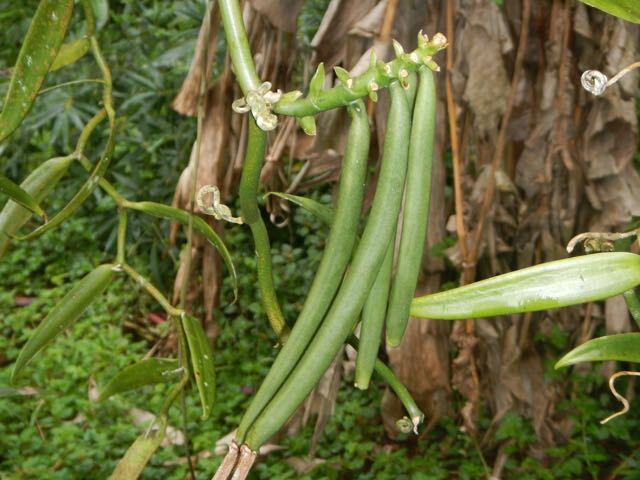 Vanilla is a vine in the orchid family. It needs to grow on another plant for support. 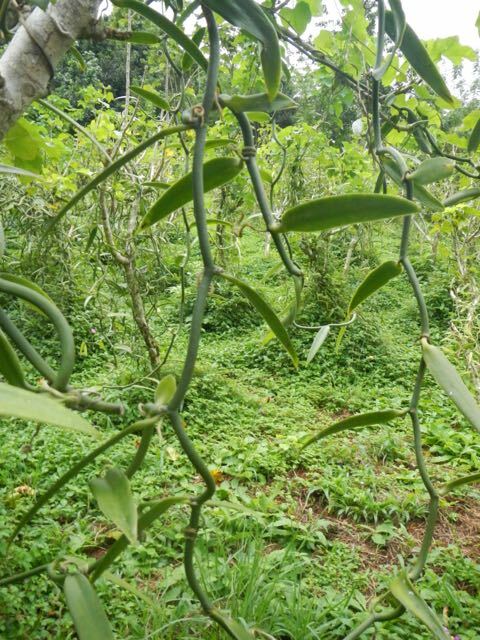 In the foreground is a vanilla vine and to the rear you can make out the woodier stems of other support plants with vanilla vines on them. 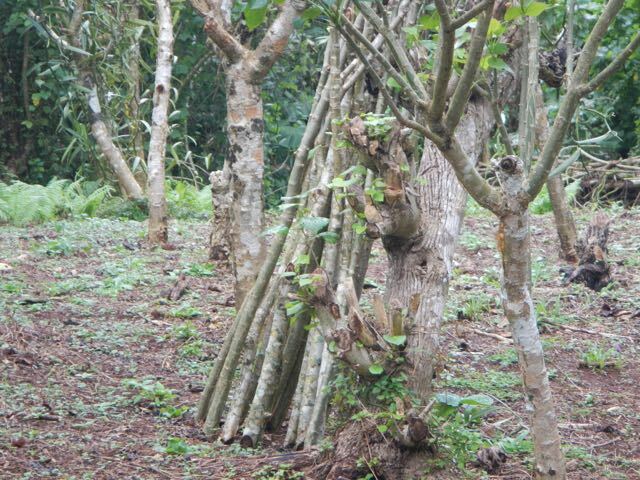 These are the sticks of the support plants for a vanilla orchard, leaning against a tree. After gathering them, you just stick them in the ground and they take root and start to grow. Really. After a couple of months, you can wrap a vanilla vine around it and it will root and start to grow as well. Unripe vanilla beans hanging from a vine. After the vines are hand-pollinated, it takes about 9 months for the beans to grow and ripen. A Pacific Rosewood tree. These used to be plentiful enough here that they were commonly used for furniture. Now they're reserved for wood for guitars and other musical instruments. Again, very salt tolerant, because that's ocean water it's growing in. Fruit from the Rosewood tree. If you nick the fruit this bright yellow sap comes out, which is a strong enough dye to be used as paint. We were cautioned not to get any on our clothes, but told it can be used on mosquito bites to calm the itch. 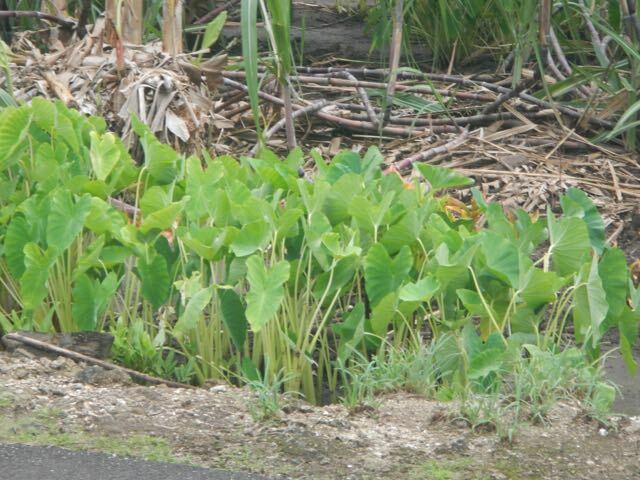 Taro plants growing in the ditch beside the road. Like rice, they need to grow in very wet soil. A traditional-style structure being constructed for the annual Heiva, or festival, in July. Each island has a Heiva, where musicians and dancers from each village compete to be chosen as the best from their island. 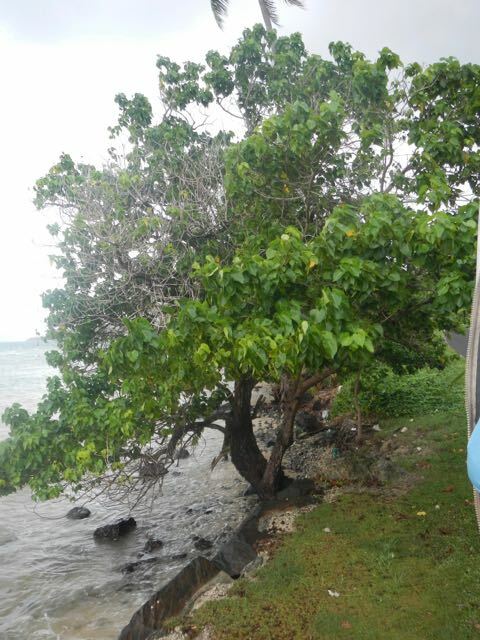 and then go onto compete in a big Heiva in Papeete. 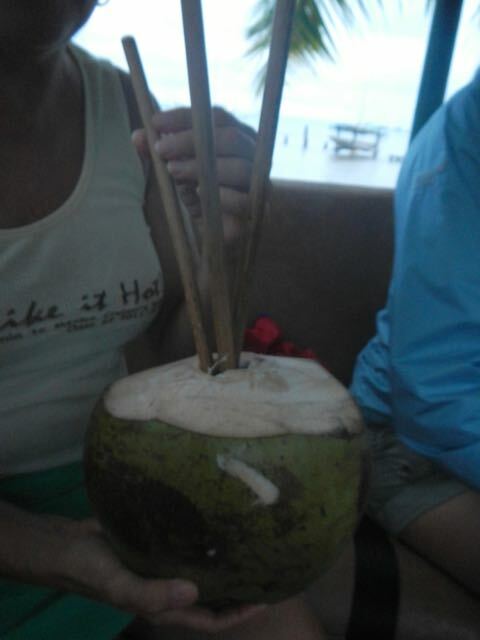 A traditional stool for opening coconut husks. 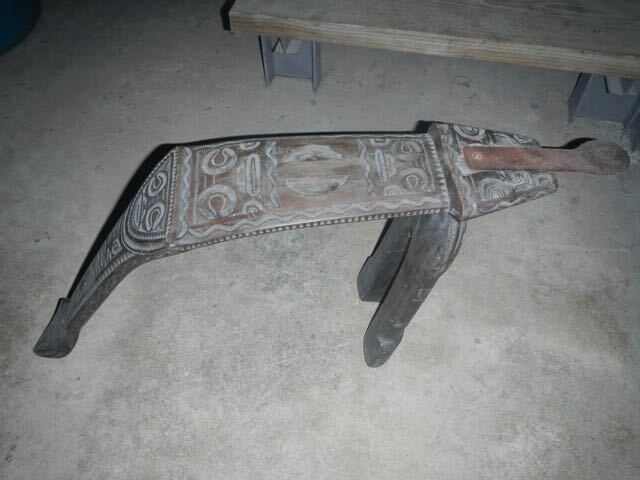 You sit on it and the sharp metal (or shell) point for opening the husk is to the right. Noah cut young green coconuts for us to enjoy the coconut water. The straws are bamboo. 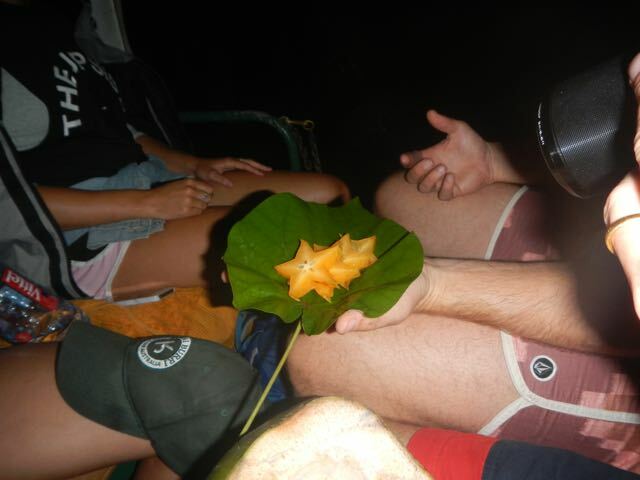 Noah also served us some of the beautiful orange starfruit from his family's garden, on a large leaf. These leaves are also used to wrap food which is to be placed in a Tahitian oven (fire-heated rocks under dirt) and baked.